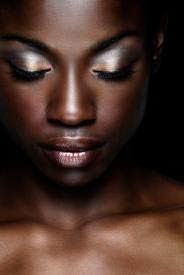 M.A.C cosmetics give you a perfect look and a flawless finish. It was a great choice for me…until last week. I blog to get my readers to begin to ask questions about safe cosmetics, be aware of safe natural hair and skin products that give great results; if not better! In my day job I sell fair trade products; as well as educate customers on the values of fairness and equality in the marketplace. Because of this, I’m becoming more cautious of what I choose to eat; as well as my choice of skin and hair care products. This is a recent shift; my only regret is not knowing this earlier. I’ve wrestled with the probability of an all-natural make-up. However, is this even possible? African tribes such as the Himba’s of northern Namibia and the Wodaabe Fulani of Niger Republic use natural red Ochre to beautify themselves, so the answer is YES! Helpful tips to protect you involve reading and interpreting labels. It takes a bit of work but it’s so worth it. In my opinion, only a scientist can understand these ingredients! Last week my dilemma was put to rest. I stumbled upon an all-natural makeup company “100% Pure” and the results are refreshingly amazing! To start I bought their tinted moisturizer with vitamins and antioxidants, which is kind of a foundation but with lighter coverage. I wanted to try this product to see if I would react to any of the ingredients [natural or not!] Thankfully, I didn’t. To be honest, I’ve been pleasantly surprised at the results. I’m so happy with it that I’ve asked my lovely husband to buy me their foundation and flawless skin foundation powder for my birthday, January 28! How to Check for Toxins in Your Products? I use the EWG Skin deep database and safe cosmetics.org frequently to decrypt safe ingredients! Strickland, Barbara. Safe Cosmetics, Powder. Zerozits.com. Sage Advice. 10 October 2005. Web. 15 January. 2012. Farlow, Christine H. How to Make Sure Your Cosmetics and Personal Care Products Are Safe. www.naturalingredient.org, n.d. Web. 15 January. 2012. Posted by Shakara Natural Tips at 12:05 a.m. Anonymous January 23, 2012 at 2:25 p.m.
Love your blog! Awesome info, thanks! Shakara Natural Tips February 6, 2012 at 7:38 p.m.